In the original Christmas classic cartoon How the Grinch Stole Christmas, I was always sort of on the Grinch's side. The Whos down in Whoville were loud, obnoxious, and utterly annoying neighbors and on top of all that noise there's some unseen singer blasting a mean and cruel song about him out loud for everyone to hear. You can see why he snapped. Like who actually likes the Whos anyways? Nobody. Anyways, now you can put up a lifesize (close enough) statue of this iconic Christmas hero right in your very own home for the holidays with this cool new Department 56 Classics Mr. Grinch Figurine. 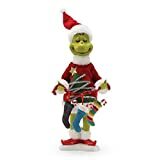 This oversized statue of an unusually festive Christmas sweater wearing Mr. Grinch is meticulously handcrafted by Department 56 and is holding up 3 Who stockings that can be filled with loot, coal, or whatever your two sizes too small heart desires. Cheers to you Mr. Grinch for standing up to inconsiderate neighbors and bullies. I would also like to give a shoutout to the hardworking, tax paying, job providing, and economy growing misunderstood businessman who shunned burning coal to protect the environment and believed in cutting back on the ridiculous amount of gifts given each holiday season (money better spent on sick children I might add), Mr. Ebenezer Scrooge. Bah, Humbug!